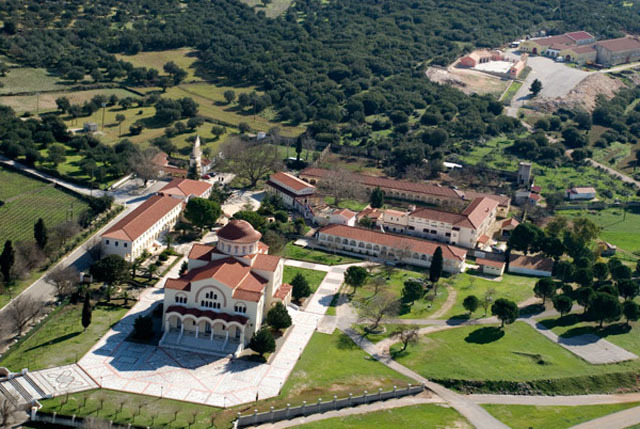 This tour starts from your cruise ship, hotel, villa, resort, yacht at any place in Kefalonia. Refreshments, snacks, traditional sweets offered during tour. Entrances fees included. Please press SELECT to book the right vehicle for you. If above do not cover your requirements please contact us . Argostoli has been the capital of the Kefallonia Region since 1757. It is the island’s commercial and administrative centre, and has beautiful neo-classical buildings. It’s a modern city with a remarkable historic and cultural tradition. Argostoli, built amphitheatrically with a view to the Lagoon of Koutavos, overlooks the fir tree-covered Aenos. Viewing Catavothres which is one of the rarest phenomena: large quantities of seawater penetrate the land at the location of Agii Theodori at Lassi without retrogressing, re-appearing by the village of Karavomylos near Sami. This is the island’s patron saint and his relics are kept in the monastery’ s smaller church in a silver sarcophagus which is opened during services for the congregation to kiss his feet .Set in the Omala valley ,known for its robola vineyards,the monastery is the island’s largest and more majestic ,with a splendid bell-tower build in the architectural style peculiar to the Ionian Islands.A small hole in the church floor leads down to an underground chamber where the saint lived as a hermit. As a sign of respect visitors should ensure the wear suitable clothing for visiting the church – a sarong is deal to cover up arms and legs. You can taste local wines among them the famous Robola. Drogaratti Cave, one of the largest and most beautiful natural sights nearby Sami. 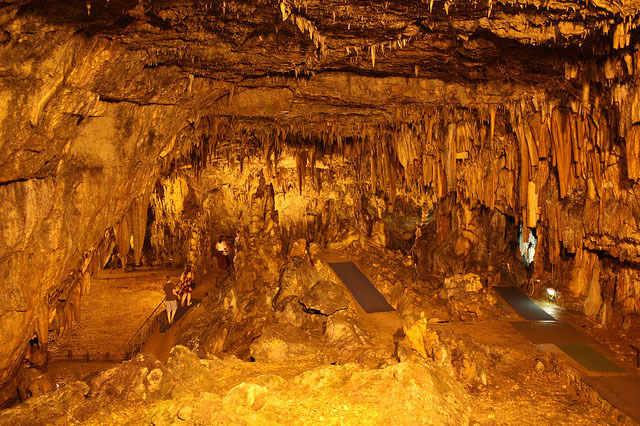 According to archeologists, Drogaratti Cave is aged over 100 million years. The depth of the cave is about 60 meters, with an average temperature of 18 °C and fairly high humidity (90%). We reach the picturesque village of Agia Efimia. It’s a quiet town sporting wide streets and good urban-planning, with a port where numerous yachts from all over the world flock in the summertime. 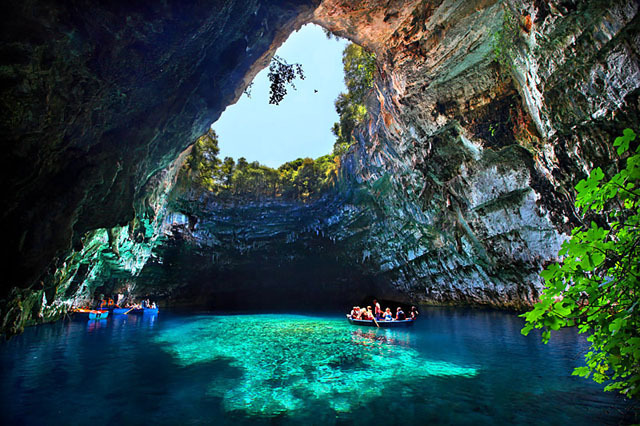 Visit Melissani Lake – short tour by rowing boat. Melissani lake is a wonderful underground lake with sublime stalactites, where some kind of worship of God Pan took place in historical times. When illuminated by the sun’s rays, sublime colors are reflected on the lake water. 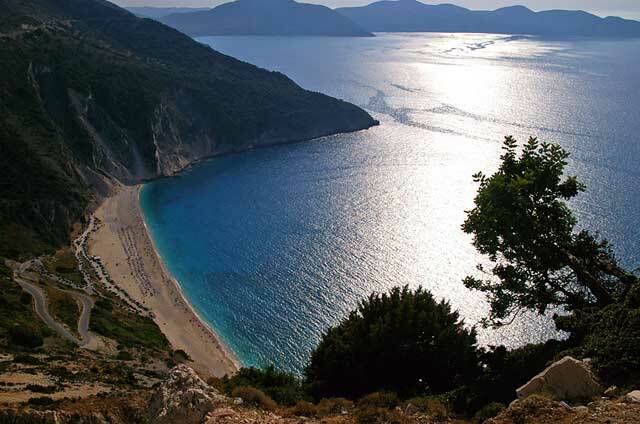 Myrtos beach , the most beautiful beach on the island and one of the most beautiful beaches in Europe, with snow white sand, a paradise on earth is protected by high rocks while the sea offers sublime combinations with colours ranging from blue green to deep blue.